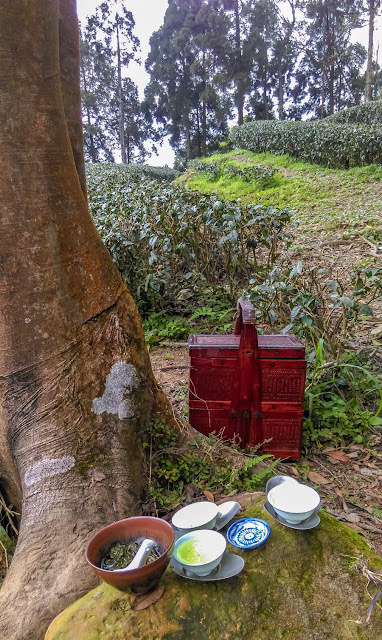 Once you get to a tea plantation, it's common to head to see the farmer and taste his tea. This is what I did and was served some winter leaves (since this spring's harvest is still 3-4 weeks off). 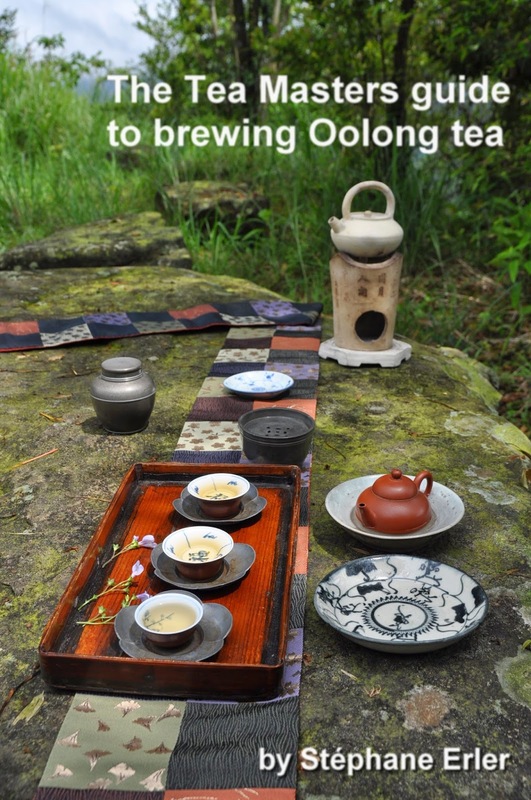 However, I found the tea and the ware and the whole interaction very bland and unsatisfying on so many levels. Luckily, I still had my plan A: brewing my own spring tea on a plantation in San Hsia! 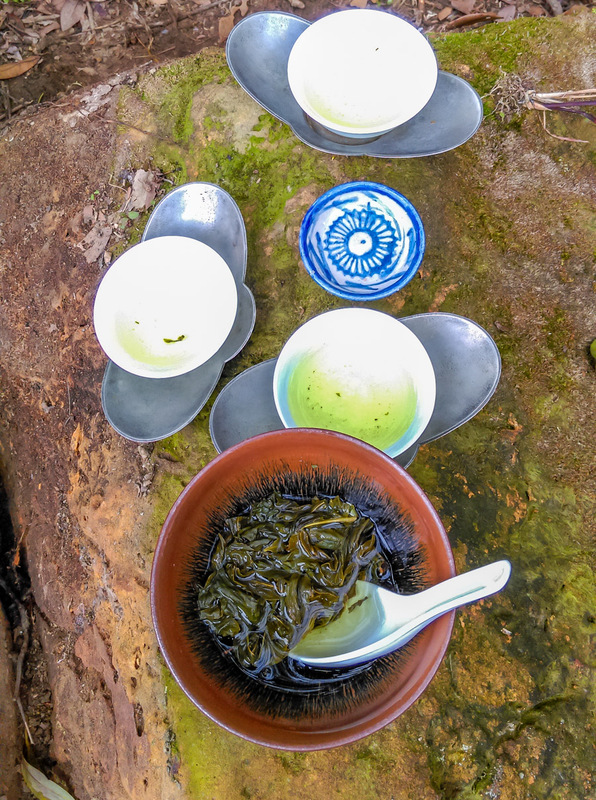 This is what I then did with this spring 2015 Wenshan Baozhong (Yingzhi Hongxin cultivar). The lightly oxidized dry leaves smell very much like the air I'm breathing here! It has this spring character and freshness combined with the sweetness of Baozhong. A rolled Oolong would be difficult to brew in a bowl, but it's not a problem with the twisted Baozhong leaves. And this allows me to use my black glazed Jianyang bowl. This type of bowl was created during the Sung dynasty (960-1279) to prepare powdered green tea (through whisking). Its thick glaze and high iron content help to reach and keep a high temperature. 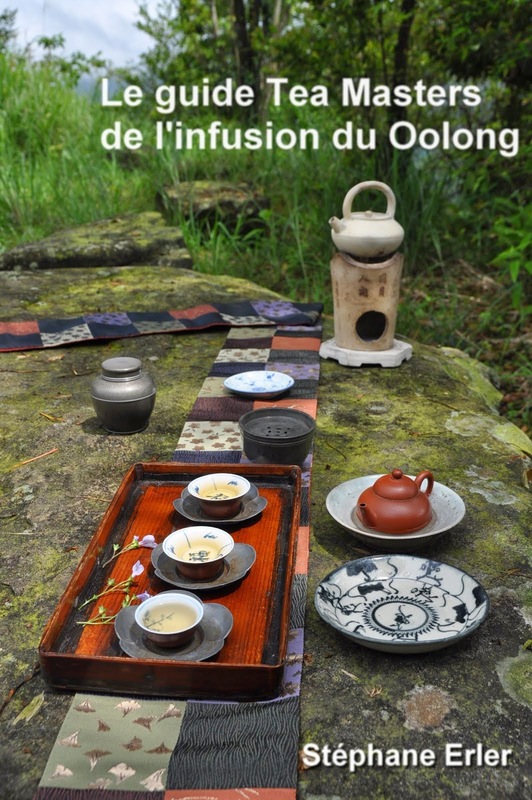 This enabled a tea revolution: until the Sung dynasty tea had always been cooked over fire. 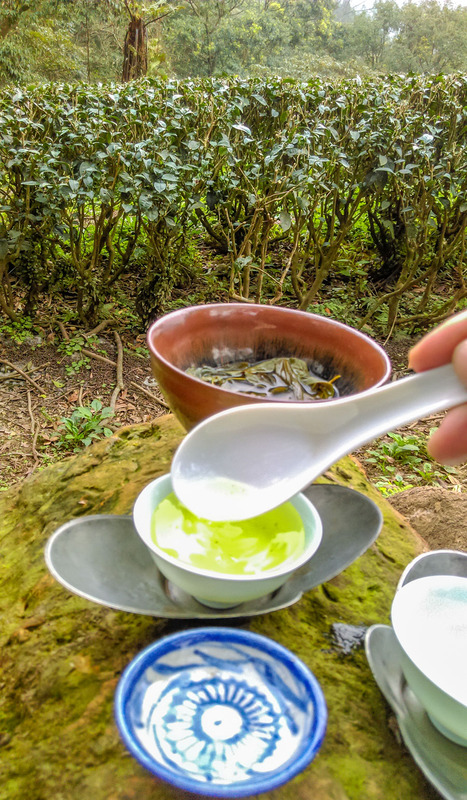 But during the Sung dynasty, tea stopped being cooked and, instead, boiling water was poured on the green tea (powder) in the bowl. 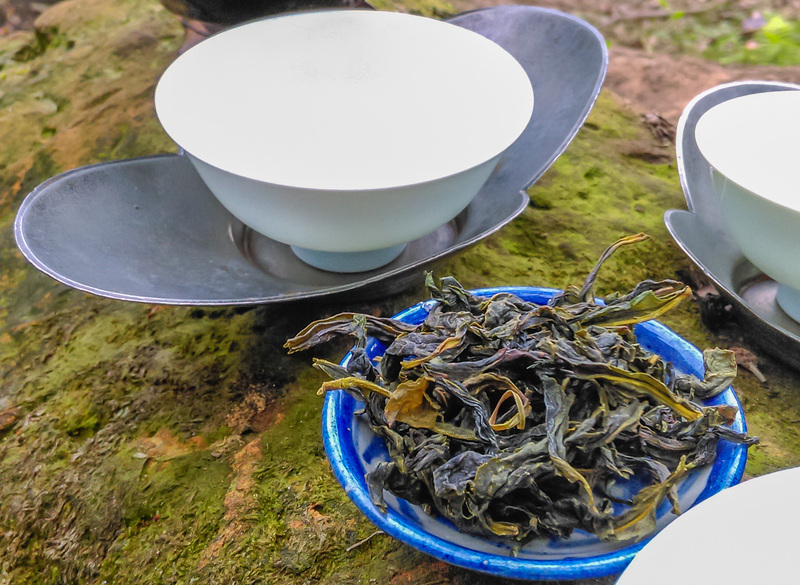 The light celadon singing cups increase the transparency and add a fresh hue to the brew. 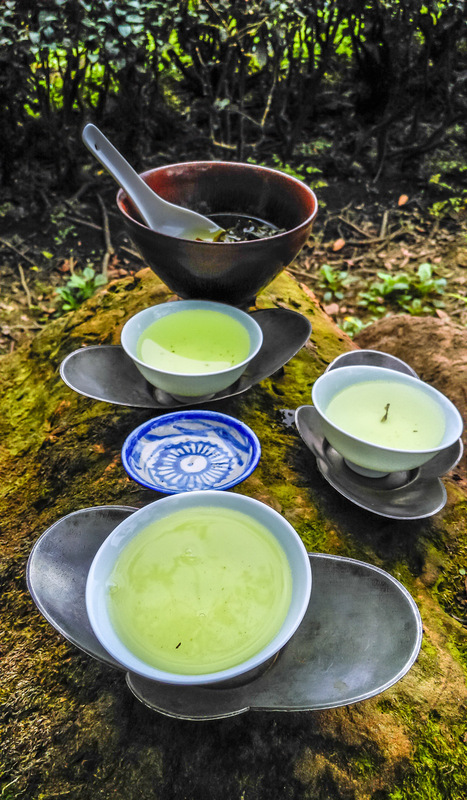 Large chatuo (stands) were already used during the Tang dynasty (618-907) to serve as saucers under tea bowls. These are made of pewter, a material that becomes interesting as it ages. The darkening doesn't happen evenly, but is unpredictable. (And it makes the cups really stand out). 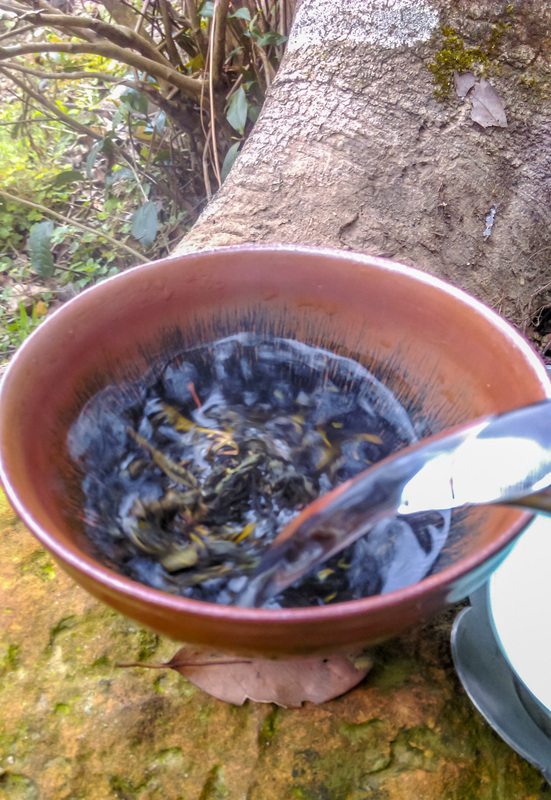 With the very first sip of this Baozhong, I thought "Whaoohh!" That's what a deep, powerful tea should taste like. It seems to resonate in the body and its raw, spring forest scents are clean and clear. This mellow and yet concentrated Baozhong brings the taste of spring to my palate. The connection between the tea and the nature surrounding me is too obvious to ignore. A perfect moment. Sip after sip. 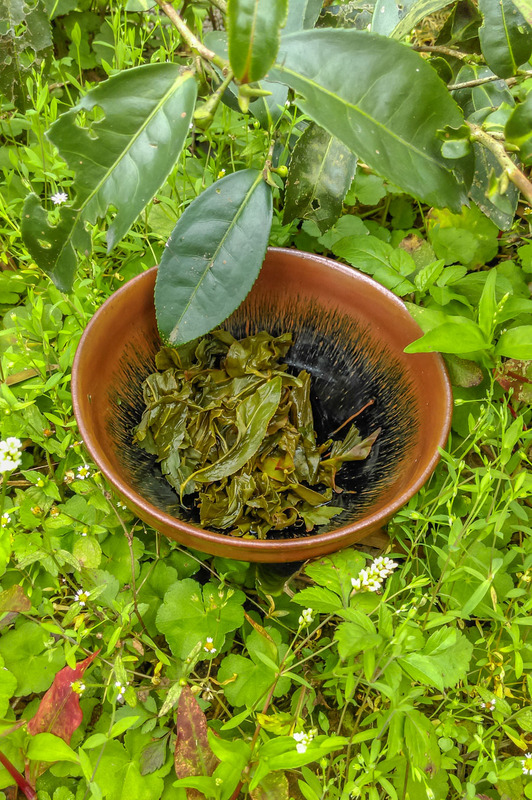 The green tea leaves look so vivid and beautiful in the black 'hare's fur' tea bowl! 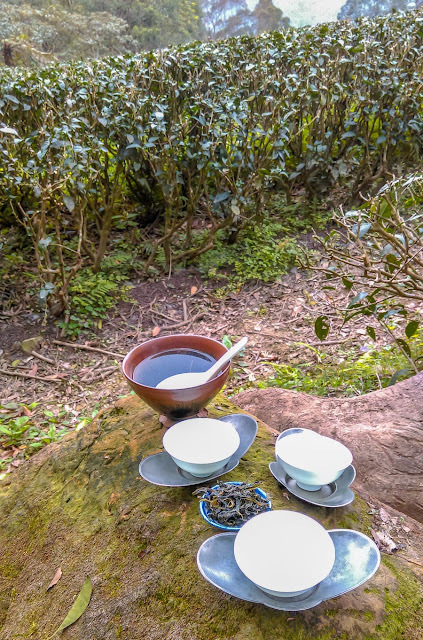 The bowl itself blends naturally among the plants on this plantation. So, even if it takes still one more month before the spring 2016 harvests, I could already experience the joy of spring with this well preserved, vacuum sealed April 5th 2015 Wenshan Baozhong.